The weather has turned cool for fall in Tokyo. How is the weather where you are? 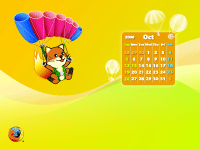 This October, Foxkeh is trying skydiving. Skydiving must feel like a nice stroll in the woods with the crisp autumn air... wait, it's probably not quite like that :). After Foxkeh lands on the ground, we'll ask him what his impressions of skydiving are. Have you been skydiving? Please tell us what it feels like if you have experienced it yourself. Can we also include calendars for Previous month and the next month on the same wallpaper. I think that becomes more useful. What do you say foxkeh..? my laptop resolution is 1440x900 and this months calendar is not stretching properly :-( it looks very distorted...last months was great but not this time, any help? My PC is 1440*900, too. When I use 16:10 the wallpaper look very distorted. The weather in Nebraska is getting cooler. Less green everywhere, headed towards yellow, orange, brown, & pale. Crops coming in. (mostly corn and soybeans) Snow in a few weeks probably. Here in Finland it's mostly wet, dark and chilly. Days are getting shorter and shorter. A bit depressing. Trees are joyfully colourful though. Now in Thailand, it is a little bit colder than last month. It should be winter right now. However, it's never turn to be cold like when I was a child in many years. That's does not mean I'm old > <"
I watch a lot of those shows about real life disasters. Like World's Most Amazing Videos on Spike TV. There are many involving sky diving accidents, so there is no way I'd sky dive. I think Foxeh is brave to try it though, although since he's a cartoon isn't he like virtually invincible? Like, in Looney Tunes the cartoon characters get really hurt, but still come back to life. It would be neat if Foxkeh could play (ice) hockey. :).. Keep up the good work! Awesome. I'm new to this and just discovered it. Here in Wisconsin US It's cold and windy. this months calendar is really cute and its got a lot of yellow,and the weather over here in Australia is hot, and its not even summer yet! its still spring,summer starts in December. i don't think ill ever go sky diving looks scary. it's cold and hot here in texas! the day starts out at 50 degrees F, and ends at 80! Please put up November soon, I'm worried I'll get flamed if my calendar is out of date. October was awesome btw, thanks. where is the new wallpaper? For those of you who'd like the November wallpapers, there is the Japanese blog that has it. http://foxkeh.jp/downloads/wallpapers/ - Y'all can get it here. For the sport, it was hockey. Thanks TwinShadow for the link for the November Foxkeh, I was getting worried of not having this month's wallpaper! Hi, I love your フォクすけ theme! Anyways, I have a question; what's the font you use for the header? For both English and Japanese, and where do you download them?